Disclosure: Sponsored post by Lunchbox. Regardless, all opinions are my own. Our youngest child, Joeli, is six and this will be her first year to really get on a bicycle. 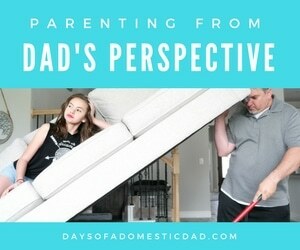 She has some developmental delays that we worked on with a physical therapist to get her to this point. She is finally ready to hop on a bike and go riding with her sisters. Of course, this means Colby and I must teach one more child how to ride a bike. 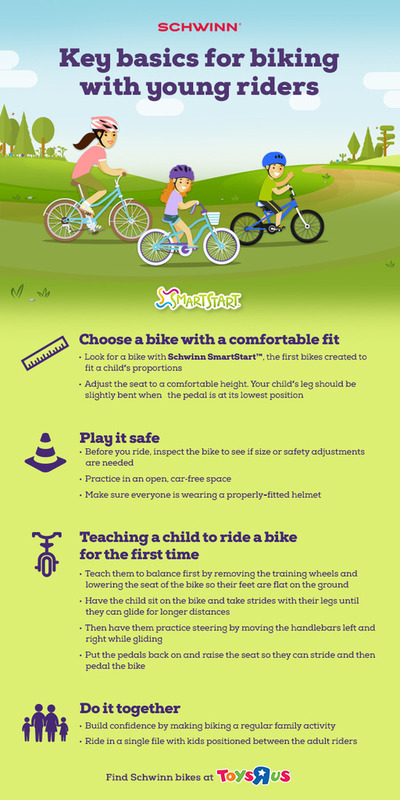 Fortunately for us this time around, Schwinn SmartStart Bicycles make learning to ride easier. 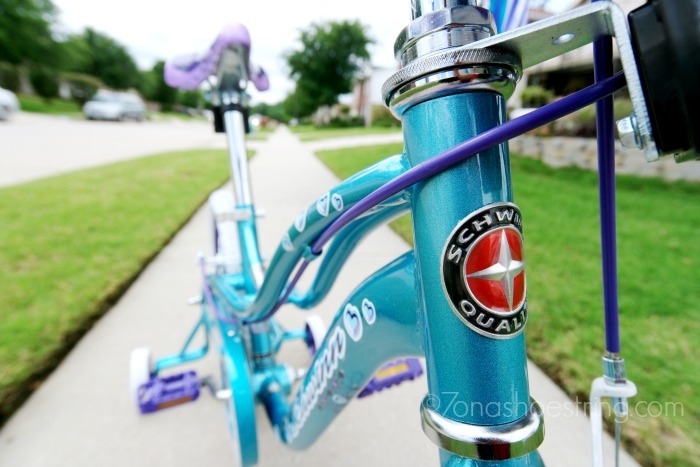 Established in 1895, Schwinn is the go-to resource for the recreational bike rider. Toys”R”Us has the largest selection of bikes for kids. On our trip to the store, a helpful associate helped us fit Joeli with the perfect Schwinn SmartStart Bike for her height. In fact, each SmartStart is built around the proportions of a child for easy on and off, as well as better handling. Each one features smaller grips, pedals that are closer together, and a child-sized seat angled in a way that pedaling is less stressful. 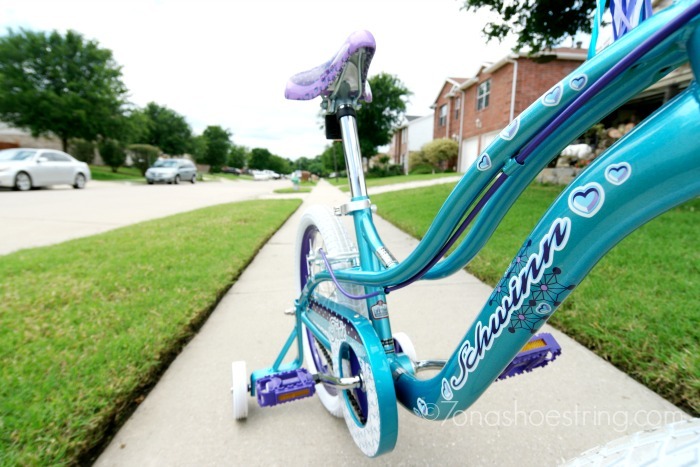 The geometry actually matches the pedal width to a child’s hip width. Needless to say, great effort was put into the design of the Schwinn SmartStart and it provides a less frustrating experience for everyone! Fun fact: When a SmartStart seat is raised to fit a growing child, the distance from the seat to the handle bars increases. This increases the reach distance and will allow the bike to grow with them. 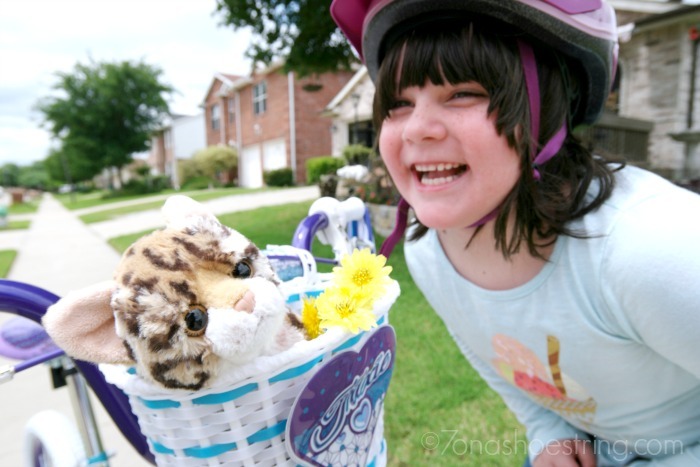 Once Joeli found her bike, she could think of nothing else but getting home to ride it! 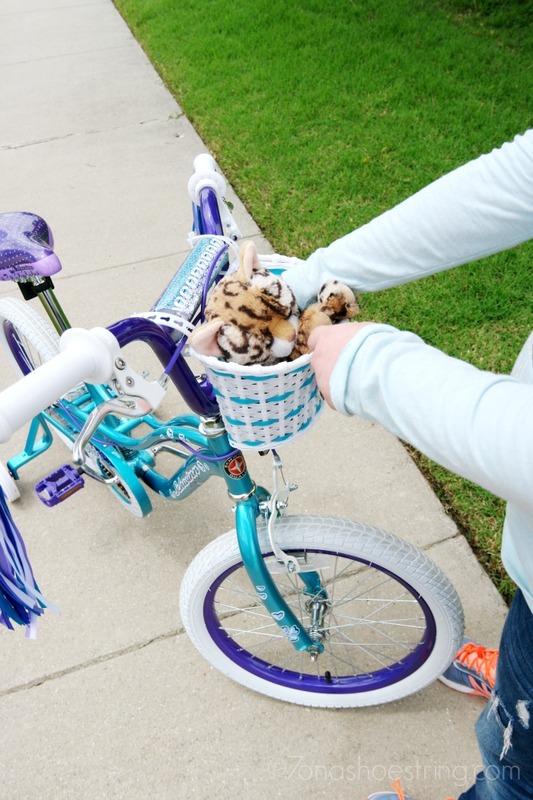 Knowing it was all hers, and came with a handlebar basket to hold her favorite stuffed animal, was almost more than her little heart could handle. She was bursting with both joy and pride. 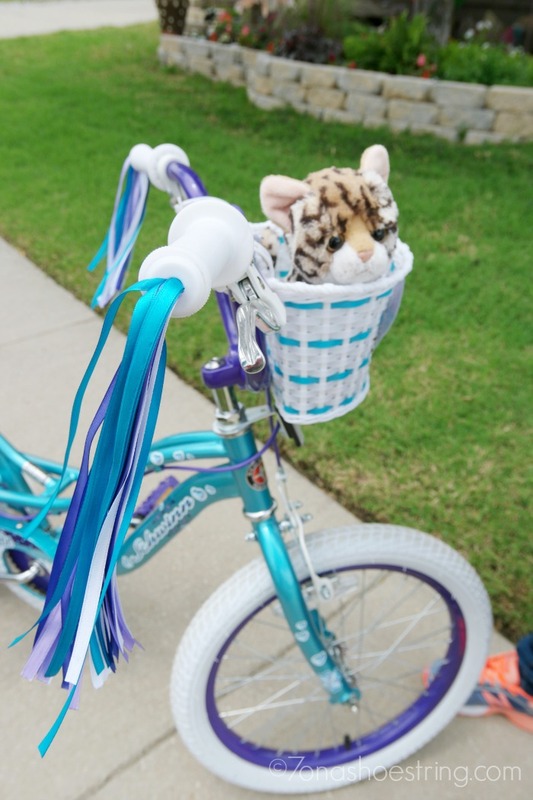 After Colby assembled the bike, it was time to give it a test ride. With her Schwinn helmet safely covering her precious head, it was time to see what Joeli could do on her first bike. 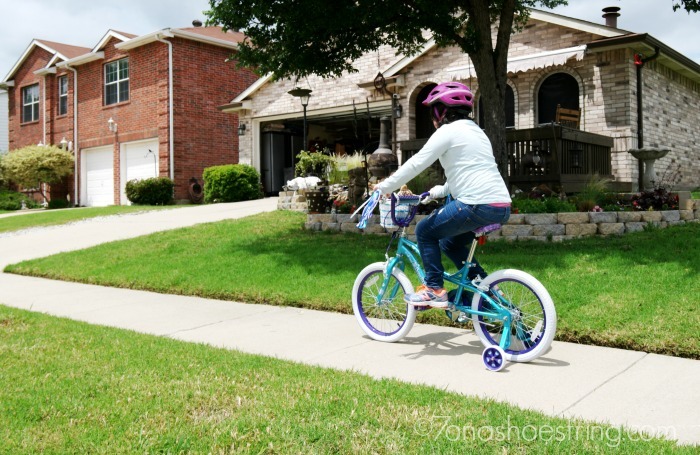 The lighter weight of the Schwinn SmartStart bicycle made it easy for her to handle as she gave it her best try on the sidewalk. The bike was also safer because there was much less wobble as she took her first spin alongside her daddy. It was truly a proud moment for us all! Once your child has mastered these basic steps, get on your bike and let them follow you. Take a slow, easy ride down the sidewalk to encourage technique and build confidence. The main focus should be on balance in order to give them a solid feel for the bicycle and how it rides. 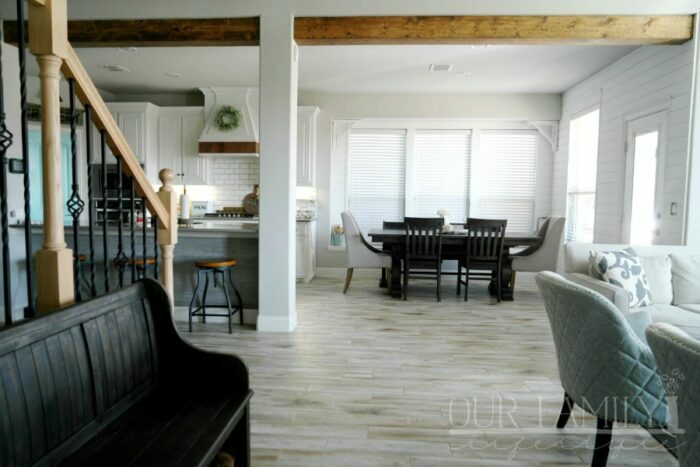 Once both you and the child feel ready, grab the whole family and take a longer ride. There is no better way to successfully continue to master their skills than with practice. Speaking of, don’t forget to work on braking. As much as they need to GO, the need to know how to STOP is just as important, if not more so. Therefore, as much as we want to make sure they pedal and steer, we also need to know they can stop when necessary. Of course, that old adage states, “it’s just like riding a bike” and the skills will eventually become so natural, they won’t even think about it.